So happy to have my Maine friend, Dan Carr, join me for the next few days. 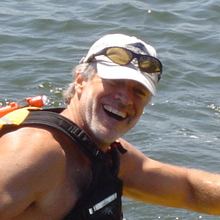 Dan is an accomplished sea kayak expedition paddler. The plan is for us to paddle the rest of the St. John River, the Bay of Fundy, and the Bold Coast of Maine to Machias. Hopefully, conditions will allow us to make that happen. 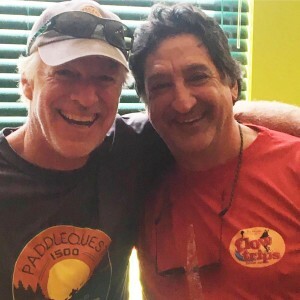 I’m stoked to paddle these challenging waters with someone as experienced and knowledgeable as Dan! 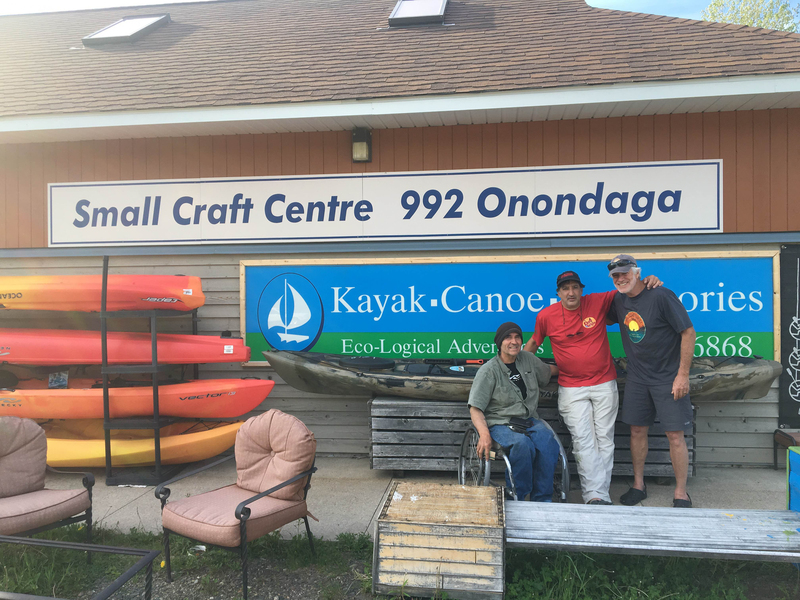 On an absolutely bluebird day we paddled from Fredericton to Oromocto, New Brunswick and landed on the dock of Eco-Logical Adventures. The owner, Paul, graciously hosted our boats and equipment while we had a layover day of rest in town. 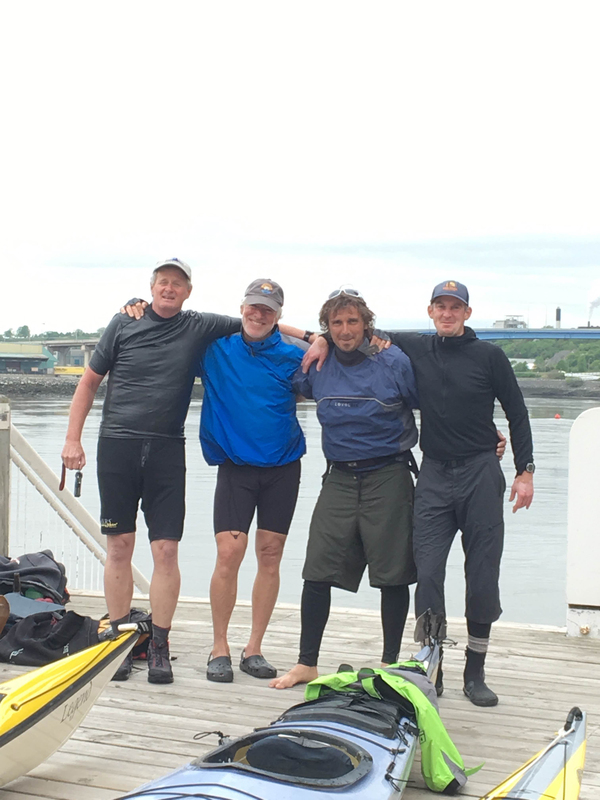 We were to meet up with Adam and Rob after that, two of my friends from New Brunswick, and the four of us would paddle the rest of the St. John River through the Reversing Falls. Adam is a longtime friend who kayaks at the Reversing Falls, year round. He is truly the best guide one could find to make sure anyone arriving at the falls with loaded expedition kayaks gets launched on the right tide. Little did I know, there was a conspiracy in play, and I was the only one who did not know what was going on. We went back into Fredericton to a pub for a beer. I wanted to stay longer, but the others said we needed to go but could have a beer at the hotel bar. So we got in the car and went back to Oromocto to the hotel where we were staying. We entered the bar and there was a lone man with his face hidden behind the newspaper at a table on the far side. As we approached, I began to get suspicious. When I got close enough, the man lowered his newspaper, and much to my shock and amazement, turned out to be one of my best friends, Rafael Gallo, from Costa Rica! No words can describe the emotions that I was feeling. Talk about speechless! Some of the photographs show me in a total state of shock. I could not have been happier! Rafael had flown to Quebec well in advance of an adventure travel meeting that he had scheduled so he could come surprise me. Not many friends who would do that for you. I am truly blessed. The next few hours were spent catching up with Rafael and having dinner. I kept in mind that I had to get up early the next morning for a very long paddle down the St. John River. I was truly blown away by the fact that Rafael would come so far to spend some time with me. It was truly awesome. The next morning we returned to Eco-Logical Adventures to get our boats ready to continue down the river, and the big push at 42 miles. We camped out on a grassy island about 20 miles short of the Reversing Falls. We had to make it there before the tide change made them too dangerous for us to paddle. So we paddled very hard for two days and hit our time window precisely. Much thanks to Adam for his planning and for pacing our trip so that this would be the case! Adam’s father was on the first descent ever made on the reversing falls by kayak and is an excellent kayaker. He joined us to run the falls, and that made me extremely happy and honored. After we checked into our hotel in downtown St. John, we went up to the falls to see them running at their fullest. The power of that water running through the canyon is a very intimidating site indeed. After we looked at the falls, we went back to downtown St. John to have dinner at a pub. Dan and I needed to do some repair work on his kayak’s skeg before we could go to bed. We got up the next morning to begin our paddle down the Bay of Fundy which is famous for having the world’s highest tides. The tide that we would experience would be 29 feet—a lot of moving water. It is important to be good risk managers when paddling in such a dynamic environment. Our put-in was delayed by a bike ride with the mayor of St. John. We simply could not get to the waterfront because the sidewalk was clogged with cyclists. So we waited. The eddy where we had to put in had a strange brown yellow foam in it, and with the rising tide it made its way up the beach like something out of a horror film. I’m not sure what was in that stuff, but I sure did not want any of it on me. I was happy to be wearing a dry suit! After having made our way through the foam, we got into St. John Harbor and paddled out to sea. We saw lots of oil tankers traveling between the refinery and the open ocean. Surprisingly, we did not see any fishing boats. We have been told that if you don’t see fishing boats on the Bay of Fundy you have no business being out there in a kayak. However, it was a beautiful day with no ocean swell or wind or waves of any kind. One thing that impressed us was the fact that there was very little tidal current. 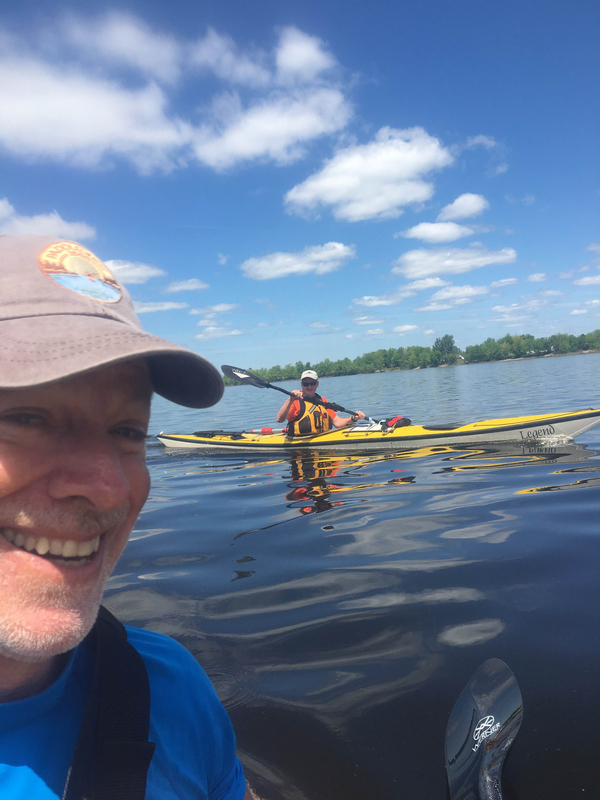 Even with the absence of current, we made fairly decent time and completed 35 miles of ocean paddling to arrive at New River Beach Provincial Park Campground at 9:30 in the evening. 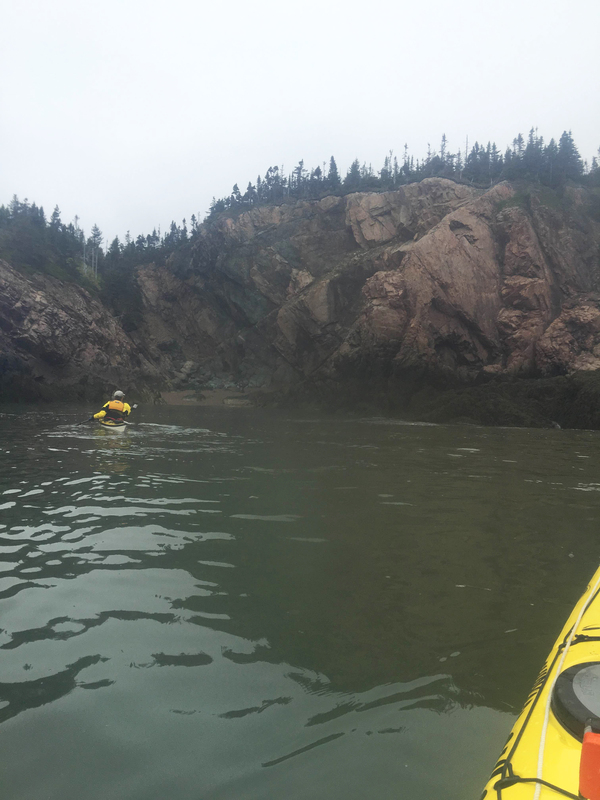 Paddling the coast of the Bay of Fundy is magnificent. The vertical cliffs rising from the ocean, harbor porpoise, gray and harbor seals, and bald eagles made for an awe-inspiring experience to be etched into my memory forever. The forecast for the following day was for 30 mph winds and 8-foot seas, so we wanted a destination where we could weather the storm and stay dry. The staff at the park were incredibly hospitable. One of the rangers was a friend of Adam and Rob’s, an accomplished sea and whitewater kayaker who was more than happy to share his local knowledge of the waters we would encounter over the next two days. Those would be our last in New Brunswick before reaching the United States border and the state of Maine. USA and the great State of Maine, here we come! But we have some business to get done between here and there! To have your surprise visit on the Saint John River in Oromocto, New Brunwick completely blew my mind! What a great treat my Costa Rican brother. Thank you! So you didn’t actually paddle through the reversing falls? You portaged it? Definitely paddled it. Hit the outgoing tide about 45 minutes after high slack. It was moving!